My copy of Lois Lenski's Indian Captive: The Story of Mary Jemison includes an excerpt from Lenski's autobiography. In it, she writes that she was surprised to win the Newbery Medal for Strawberry Girl in 1946, because she thinks Indian Captive is her "major and most scholarly work." Fictionalized account of Mary Jemison. She was captured by the Seneca Indians when she was a child and lived with them all her life. The chances that you read Indian Captive in school are pretty high. 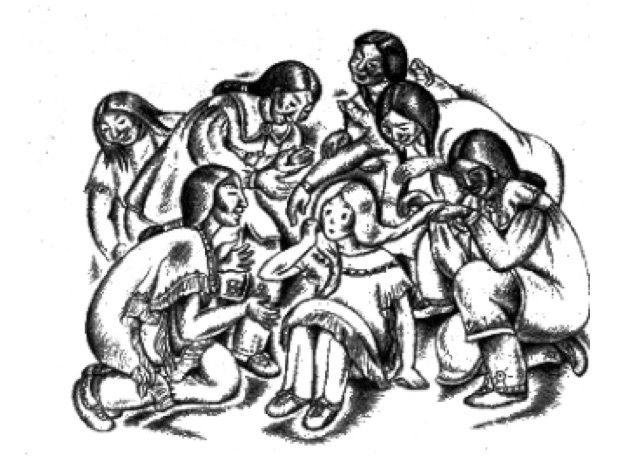 These captivity stories--of white girls/women captured by Indians--are very popular. The Newbery Honor adds to its allure. There was, in fact, a woman named Mary Jemison. She was born in 1742 or 1743 and died in 1833. Before she died, she worked with James E. Seaver on A Narrative of the Life of Mrs. Mary Jemison, which was published in 1824. One thing that struck me right away is Lenski's depiction of Jemison's hair. In the original edition, you see that Lenski depicts Jemison as having blonde hair. That is inaccurate. Jemison's hair was, according to Seaver, "a light chestnut brown." My guess is that Lenski changed it to fit the story she was telling. 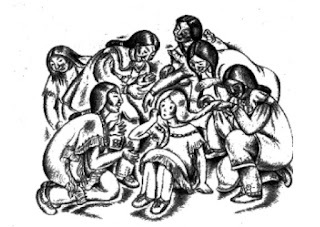 Many works depict Native characters who are fascinated by the hair of white characters. Were they? Maybe. 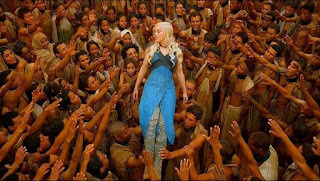 I need to look for evidence of Native fascination with the hair and skin of white people. Certainly we find a lot of that sort of thing in writings of White people who describe skin color in derogatory or exotic ways. Is it fair to compare those two images? Maybe, maybe not. I do think they capture that idea that Whiteness is special. ...the thing that pleased them most was Molly’s hair— her pale yellow, shining hair, the color of ripened corn. They took it in their hands; they blew upon it and tried to braid it; they let it rest like corn-silk soft upon their palms. They looked at it as if they had never seen such hair before. They touched her white skin, they stared into her blue eyes, they caressed her soft, silky hair. It was her hair that pleased them most. It made them think of blooming corn-stalks, of soft, fresh corn-silk, of pale yellow ripened corn— the dearest things in life. So when they gave her a name, there was only one that they could think of. They called her Corn Tassel that day and for many a long day thereafter. I was made welcome amongst them as a sister to the two Squaws before mentioned, and was called Dickewamis; which being interpreted, signifies a pretty girl, a handsome girl, or a pleasant, good thing. That is the name by which I have ever since been called by the Indians. I think Lenski didn't want to call her Dickewamis, or an English translation, either. She chose Corn Tassel instead. I want to think about that choice a bit more. We could say that, by changing the name, she was being dismissive of the Seneca's. To her credit, Lenski didn't use "squaw" anywhere in her book. Simply avoiding that derogatory term is not enough, however. As I read Indian Captive, I found that biased, outsider depictions remain intact. The Seneca man who was killed, Lenski tells us, went to "the Happy Hunting Ground." In a lot of writings by outsiders, that phrase is used to depict a Native heaven. It is used as if all of us, regardless of our very diverse and distinct spiritual or religious practices, go to the "Happy Hunting Ground." As far as I can tell, that phrase came from James Fenimore Cooper. My research into his use of it is ongoing. In Seaver, there is no mention of being mistreated by the Seneca women who adopted her. Lenski, however, does have her mistreated (hit and kicked) by "Squirrel Woman" who is not only mean, but unattractive. Eventually Molly doesn't cry when Squirrel Woman strikes her. At one point, Molly thinks that, "like an Indian," she is learning to bear pain. That is another stereotype: the stoic, unflinching, noble Indian. That passage is deeply unsettling. It lets stand the idea that Native peoples were cruel, aggressive, and warlike, and that the White people who attacked them and encroached on their homelands were the ones who can teach love and sympathy. There is much more to know about Jemison and her role in Seneca history. As I did the background research to write this review, I began reading Mark Rifkin's study of her/depictions of her in When Did Indians Become Straight? : Kinship, the History of Sexuality, and Native Sovereignty. He writes that in white writings of her, the focus is on her Whiteness and the incredible aspects of her capture and life as a White person living with Indians. It is, he writes, a racialized discussion. Far more important, he argues, is her adoption and what it meant to Native Nations and their sovereignty. Through her adoption, she became Seneca. Through her adoption, she owned Seneca land. I'll be studying Rifkin's chapter on her, and looking for others, too. For certain, Lenski's Indian Captive is flawed. It relies and draws on stereotypes. Indian Captive was written 75 years ago. It need not be read today by schoolchildren. Doing so, I think, keeps stereotypical ideas of Native people and history intact. Teachers ought to be challenging those stereotypes and bias, rather than affirming them. If you know of a teacher who is using it to teach children about stereotyping and bias, let me know. Lenski, Lois (2011-12-27). Indian Captive: The Story of Mary Jemison. Open Road Media Teen & Tween. Kindle Edition. Rifkin, Mark. (2011) When Did Indians Become Straight: Kinship, the History of Sexuality, and Native Sovereignty. Oxford University Press. Wow! I am shocked, though I guess I shouldn't be, to know that such a book is still in print. I had never heard of it--I only knew of captivity narratives as Early American texts that were very popular at the time they were published. In other news, I went to grad school with Mark Rifkin and he's a friend of mine, so I'm so happy to see his name here. Last year, I started doing the research on Jemison but had set it aside to work on other projects. Yesterday, I got an email from a parent in Minnesota. Her fifth grade child is being assigned INDIAN CAPTIVE and she wanted to know if I had reviewed it. Her email prompted me to upload what I did, today. Another excellent review. Obviously there are some very problematic passages in this book. Maybe it's time for another author to novelize this biography more accurately and sensitively. Just on the subject of the Seneca reaction to Molly's golden hair: I can't speak for how things are with Native peoples or were in those days, but many blondes or redheads will tell you of just this kind of experience when visiting Asia or other places where such hair is rare. And of course African people face this too, among people unfamiliar with their hair texture. My daughter had blonde curls when she was little. Many times we noticed tourists (Mainly Chinese) taking photographs of her. Sometimes they asked permission sometimes not. Once we were "mobbed" by a group of middle aged Chinese ladies on the ferry. Lucy was about three. They all wanted photographs with her! I didn't mind and My daughter enjoyed it. Anyway, that's definitely an experience lots of blondes have. My red haired sister got a lot of attention when she worked in China too. "That passage is deeply unsettling. It lets stand the idea that Native peoples were cruel, aggressive, and warlike, and that the White people who attacked them and encroached on their homelands were the ones who can teach love and sympathy." As we know, Natives were utilizing the right of self-defense to counter an immediate threat of violence...and to help others appreciate this viewpoint, we need more Native voices to write from this perspective as literature is rife with this flawed misconception! I teach in a school very near to where Mary Jemison lived (just south of Letchworth State Park). We don't have this book in our elementary library, but we do have one in the biography section of our MS/HS library (which I plan to weed). We have a more recent book about her called "The White," which I haven't read yet. I hope it's more accurate and less full of stereotypes. Hair: Fascination with blond hair is still demonstrable today. What is different fascinates us. When I taught 8th graders 20 years ago, there was a girl with long, white-blonde wavy hair. My school was 90% Hispanic, so this was unusual. The Hispanic girl who sat behind her would stare at it all the time, and would occasionally touch it lightly. The blonde girl told me after class that this made her uncomfortable, so I took the other girl aside and told her that yes, the hair is lovely, but please don't touch it. She told me her grandmother told her that touching blonde hair was good luck. In Asia, blonde tourists sometimes find themselves the center of attention. So this isn't a stereotype of Native Americans, it's a common HUMAN reaction to something new. "Indian Stoicism": In a lot of hunter-gatherer, pastoral and agrarian societies, complaining is viewed as a useless activity, so it is not encouraged. It probably wasn't encouraged much in colonial America, either. This may or may not qualify as a "stereotype," but in one aspect of children's literature, part of growing up is dealing with reality and not complaining so much. IMO, this should be encouraged by all cultures. In the book it shows that she is expanding upon her set of values and learning from others. Compassion for the turkey: OK, now THIS is ridiculous, and I agree wholeheartedly with your assessment! I think Lenski was trying to show children that we can all learn from each other, and all cultures have much to offer (she wrote prolifically about children from all cultures in the USA). In that mission I think she succeeded, with some obvious flaws. Remember, too, it was written in 1948--- a time of much less cultural awareness---the year New Mexico finally granted Native Americans the right to vote. I read this book as a child back in the 1960s, and I didn't remember the turkey thing at all. What I do remember is that it helped fuel a lifelong interest in Native Americans and made me want to learn as much as I could. I am not of direct Native ancestry that I am aware of, but in my family tree there are marriages to Algonquin and Lumbee people. The curiosity became a powerful part of my life as a person, an American, and a history teacher. I think this book can be used in the classroom if it is done carefully, and in the larger context of cultural respect. Stereotypes and outright mistakes should be pointed out and discussed, but don't dismiss this book. It was the only one of its kind for many, many years. 1) I find it interesting that with all these examples of the fetishization of blonde hair, not one of them is of any actual Native Americans. You can't just generalize from one group of dark-haired people to another and claim it's a natural "human" reaction. We're also talking about a group of people who would not have been saturated with Western European beauty ideals, remember, unlike people living in the Hollywood-dominated globalized cultures of today. It is just as human to find a physical characteristic with which one is not familiar to be freakish and repellant (see European assessments of black people, for instance). Adoration of blonde hair is not actually an innate human trait. Neither is adoration of difference. 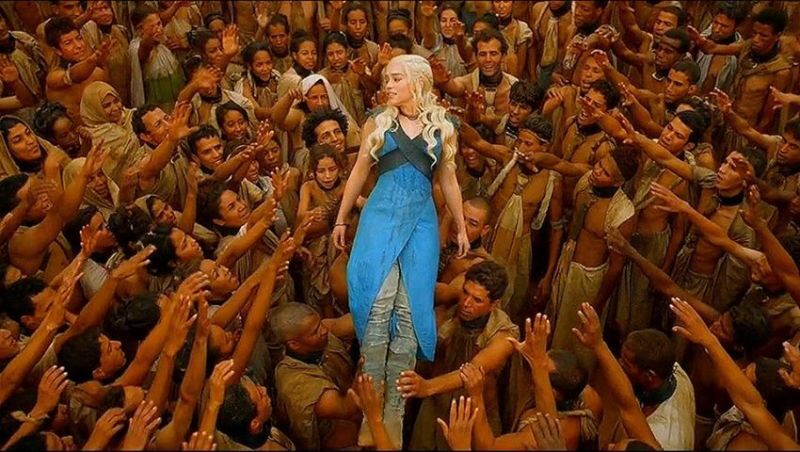 I have spent some time in Sweden, where I have literally met one other white woman who wasn't blonde, and no other white people with curly hair. Yet Swedes do not surround me, stroke my hair, talk about how beautiful it is, and name me after it. More to the point, since Jemison did not have blonde hair, and did not recount such incidents, we must wonder why this reaction to blonde hair is such a significant part of Indian Captive. Why create such stuff out of whole cloth? What purpose is it serving? As Rifkin notes, this is about the racialization of difference, the creation of race as the key factor in Jemison's interactions with the Seneca, rather than nationhood, sovereignty, land, etc.. And in this case, the white preoccupation with race is being put in the mouths and hands of the Seneca--classic projection--in a way that naturalizes white beauty ideals by portraying them as universal. 2) Stoicism is not being portrayed in this book as "part of growing up." It is being portrayed as "becoming like an Indian." If it Lenski had portrayed it as a familiar value/trait of adulthood to Mary--if Mary had thought something like "Maybe this is what Pa meant when he said being adult was hard," it would not be a racist stereotype. But the stereotype of the stoic Indian, silent in the face of suffering, was old by the time Barrie used it for Tiger Lily in Peter Pan. 3) A book that was singular in the 1940s and OK in the 1960s is not necessarily acceptable in the twenty-teens. There are now plenty of other books available to non-Native children to interest them in the many Native cultures of America. There's no need to continue to highlight one that is inaccurate and contains such stereotypes. I'm pretty sure I read this in 4th grade (a year later I would read Anpao. Yikes) but I don't remember much about it. I do cringe every time I see it suggested as a "biography." The passages you quoted are very clear in that Mary, by virtue of her blondeness and whiteness, is there to make the Seneca "better" and "more civilized," which is so completely wrong and disgusting that I cannot imagine how people don't see the offensiveness here. But they just plow into it and say, "LOOK WE ARE REPRESENTING NATIVE AMERICANS YAY DIVERSITY." That's not how this works. That's not how any of this works. Thanks so much for this review, as always. I adored this book as a child in the forties, and as a child with pale blond hair, privately thought of myself as "Corn Tassel". I can see the racist implications now, as a adult re-reading, but at the time I felt only a deep empathy with the Indians who took in Mary Jemison and whom she deeply loved. At age 11, in 1948, I moved to postwar Tokyo, and there experienced the curiosity with my blond hair. It didn't feel intrusive, not even when my hair was touched, as it occasionally was, on a public street, but rather an experience of fascination-with-the-other, some thing I felt in the reverse, myself. The portrayal of one Seneca woman as cruel does not, in my opinion, feel wrong. There are cruel and insensitive people in every culture and a writer works hard at creating conflict to move the narrative along. There are other instances mentioned which are indeed stereotyping and a teacher should point out those flaws to a young reader, but I would hate to see the book discarded. It is a fictionalized account of an actual set of events. Perhaps my opinion is colored by my memory of such a deep affection for the story, for Mary Jeminson, and for the Senecas. I learn as much from reading Debbie's well researched and thoughtful critiques as I do from the comments section. Different is quite often viewed as ugly. But let's say for the sake of argument that different in this case was viewed as unusual & beautiful. How long might that be so before it became ordinary? Further,the fact that "white" was the color of the people who were encroaching on Native lands and taking what did not belong to them by force. I doubt any society would have seen "whiteness" as the embodiment of beauty or mercy. Given that, the Seneca were amazingly generous and just with this child. This is an important cultural aspect that says much about the values of Native peoples from that period. It is also the lesson that appears lost in a story centered on "whiteness". Books that portray "whiteness" as the epitome of beauty and all things good for young readers deliver a poisoned apple. I hope teachers and librarians will reconsider having such books in their collections. I agree that there are some stereotyping aspects about this book, although I don't pretend to be knowledgeable about the Seneca culture or other Native American tribes. However, I disagree with those who have interpreted Lenski's description of the Senecas' fascination with Mary's blond hair as saying that whiteness or blond hair is superior. Difference and unusual coloring can be just different, not "better" or "worse". She was made to work hard, as all of the other girls in the Seneca culture were. I did not see any indication in her general treatment that Mary was set up as a superior being, nor that the white culture was believed to be superior by the Seneca. I adamantly disagree that "whiteness" was portrayed as "the epitome of beauty or mercy" as one commentator stated. Overall, I believe Lenski did her best to show respect for the Seneca culture and people. Mary learned many things from her captors and as we know, chose to stay with them when she had an opportunity to return to white society. She appreciated the ways that the Seneca tried to live in their environment without wasting natural resources, and that actually their raids on the homes of white settlers were a response to the impingement on Seneca patterns of life. I think it is made very evident in the story that the Seneca were just and generous with Mary. She was treated as well as other Seneca girls were treated. 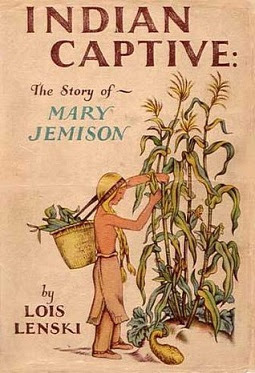 Finally, although some people have undoubtedly called Indian Captive a biography, Lois Lenski herself stated it was a novelization. Changes were made to the retelling of Mary's early captive years to make the story more accessible to children. She modified some things such as Mary's early motherhood, and no doubt Turtle Woman was a created character who was used to create some conflict in the story of Mary's adaptation to the way of life into which she was taken. I don't doubt that there were some members of the Seneca community who were welcoming, some who were not involved with Mary, and some who were antagonistic. It's been a few years since read the book and I have a vague recollection that Turtle Woman had a son or brother who was killed by white men, explaining some of her animosity to Mary. I see this as a human reaction rather than an unjustifiable stereotype of a fictional character. I really appreciate this thoughtful post and all of the comments. 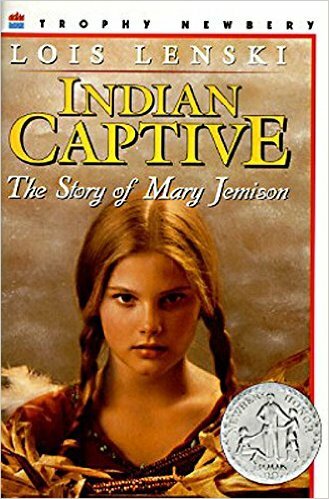 I have not read "Indian Captive", but given when it was written, I can imagine that even when she was trying to be sensitive, Lois Lenski's portrayal of the Seneca and Mary Jemison's experience inevitably doesn't stand up over time. I do urge readers not to dismiss Lenski's work out of hand. She displayed some pretty progressive ideals in what were called her "regional" books, dealing with racism ("Mama Hattie's Girl") and classism. If you are interested in reading a well researched biography of Lenski, check out "Lois Lenski: Storycatcher" by Bobby Malone. I agree with you. I too am from the area and I read the book in school as a child myself. And like you I enjoyed it so much I did a lot of research on the Native American people especially the Seneca and the rest of the Iroquois tribes. Fascinating.